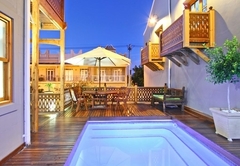 Wilton Manor is one of the highly recommended Green Point guest houses and provides accommodation in 6 guest rooms for tourists visiting the Atlantic Seaboard region. 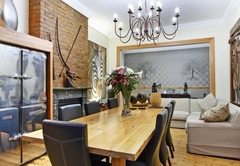 Large luxury Victorian house dating back 130 years with African charisma and style to be experienced. Ideal for groups and travellers requiring something special. 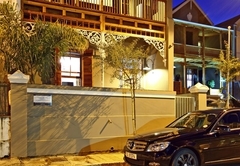 Situated in the historic suburb of Green Point Village, Wilton Manor nestles in the quaint, peaceful Croxteth Road, with views of Green Point stadium. 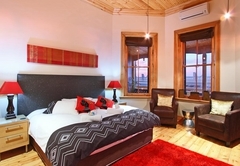 The V&A Waterfront, local restaurants and bars are within walking distance. The city centre is a 10 minute drive, whilst Clifton and Camps Bay beaches are approximately 20 minutes and the airport 40 minutes’ drive. The motorways are in close proximity for inland sight-seeing. 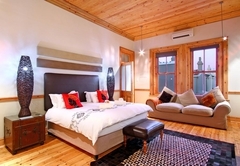 Wilton Manor shares with the visitor a diverse mix of African art and old-style Cape grandeur. 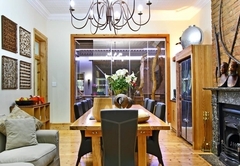 Wrap-around-balconies, high volume ceilings and wooden floors are quaint features. 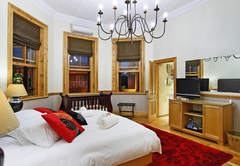 Thirteen double volume rooms, each en-suite, have been tastefully restored. 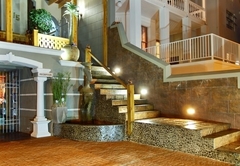 The unique African crafts, spaciousness and colonial history create an elegance to be experienced. 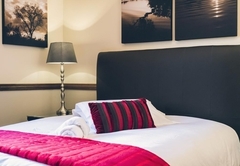 Crisp white linen and fluffy towels make the visitor feel "relaxed away from home". The communal lounge and breakfast area leads to the outside entertainment area. The lounge has a fireplace, to add ambiance and romance to the evenings. 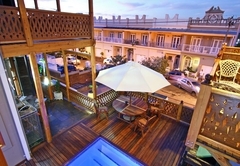 The outside deck and “braai” (barbecue) area allow visitors to enjoy the African sun. Loungers around the swimming pool lure you to come and relax. A self-help barbeque and bar service is always available to our guests. There is off street parking on the property with an electric gate for easy entry and exit. Wilton Manor Rooms are spacious and airy with large windows. 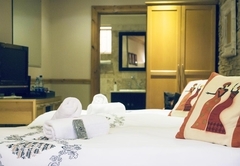 All rooms have en-suite modern facilities: shower, wash basin and toilet. A bath is available in one room. 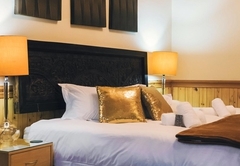 Each room is tastefully and individually decorated, features a king or queen double bed (some with single beds), air-conditioning, a hairdryer, and coffee tray. 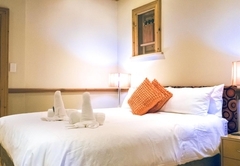 Relax in your room with the satellite television, DVD player and WiFi. Some rooms also have seating areas. The larger family rooms have space for one child. To complement your stay, our wonderful on site Hostess, Alice, will cater for breakfast and other meal requirements you may have. Breakfast is served from 07h30 to 10h00 am. Our guests enjoy breakfast at Wilton Manor - fresh fruit salad and juices, a selection of cereals and your choice of eggs, omelettes, sausage, bacon, mushrooms, breads and pancakes are served. Alice can also assist with general enquiries. Our tariff includes Bed & Breakfast, fruit and snacks. Room occupancy is for two people sharing. During peak periods, the minimum stay is three days. Wilton Manor is also available on a full house basis. Parking is offered free. Items for the guest account will be bar and drinks, telephone related expenses and laundry. As an optional extra - to add further enjoyment to your stay - why not enjoy a barbeque in the rustic entertainment area. 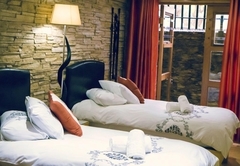 Personal service, a unique African 4-star Guest House experience, splendid rooms and a warm and caring atmosphere. 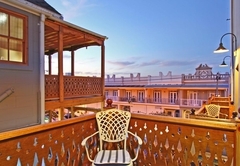 Let us enhance your visit to the wonderful Cape! The entire property is walled and fenced, within regulations from the Historical Conservation Authority. Wilton Manor has a security guard at night. 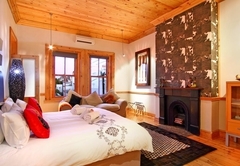 Single room with three-quarter bed. 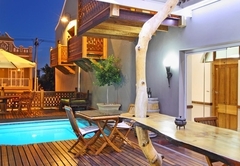 Private balcony overlooking swimming pool. En-suite bathroom with shower only. Limited free Wi-Fi. 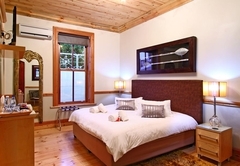 Air-conditioning; flat screen TV with limited satellite channels; tea / coffee tray; linen and towels; daily cleaning. Twin beds. 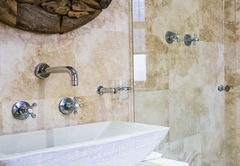 En-suite bathroom with shower only. Limited free Wi-Fi. 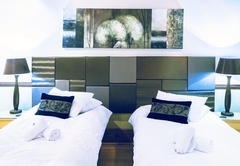 ; Air-conditioning; flat-screen TV with limited satellite channels; coffee / tea tray; linen and towels; daily cleaning. King sized bed and en-suite bathroom with shower. Stylish room with seating area and shared balcony. 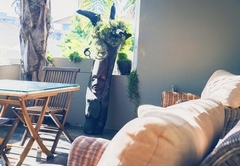 ; Limited free Wi-Fi; air-conditioning; flat-screen TV; coffee / tea tray; linen and towels; daily cleaning. 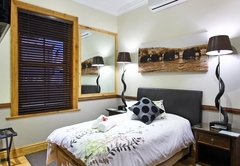 Large room with king sized bed, plus small single bed suitable for a child under 12. Private outside patio with seating and barbeque. 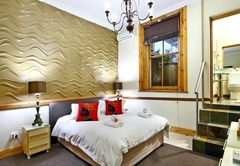 En-suite bathroom with shower; free Wi-Fi; air-conditioning; flat-screen TV; coffee / tea tray; linen and towels. Beautiful rooms, dining room and terrace. African theme. Close proximity to all major attractions. We had such a lovely visit. The staff made us feel very welcome and at home. Especially Victoria, Mirriam, Thuli Adonis and Conny!!! Our room was spotless, inviting and modern with real goose down duvets. Breakfast was a delicious feast with choice of fruit, yoghurts, breads, cereal and full English breakfast with scrumptious pancakes to top everything off. Will highly recommend to all travellers!!!! I love the place and the staff. Have been there a couple of times. Response timeWilton Manor typically responds to requests in 5-10 minutes.